Built in Rhodesia in 1976, the Pookie is a light armoured landmine detection vehicle, designed to clear mined roads. The Pookie comprised a monocoque V-shaped armoured capsule raised 700 millimetres above the ground between the front and rear suspension units taken from the Type Two Volkswagen Kombi. The capsule was designed to protect the operator/driver from small arms fire in ambushes as well as from the blast of an exploding landmine. The 700 millimetre clearance was important because the V-shaped explosion of the anti-tank landmine begins to lose its concentrated force at 500-600mm. The suspension provided by the Volkswagen Kombi was also crucial because the trailing-arm torsion bar suspension exerted less downward thrust than conventional coil springs. In addition, the Pookie drove on wide Formula-One tyres and achieved a ground pressure of 3 pounds per square inch, lighter than the human foot. Thus, the Pookie would not even detonate an anti-personnel landmine. The width of the tyres meant also that Pookie would span any landmine hole. Consequently, the Pookie was the only vehicle (and retains this distinction to this day) that could drive over a buried landmine without detonating it. This allowed the driver to use South African Milton metallic landmine detecting pans to fix the position of the landmine precisely. If a Pookie detonated a landmine, and it never did, the use of shear bolts meant that wheels would be blown harmlessly away, as would the battery, the 40-litre fuel tank and the rear mounted 1600 cc air-cooled Volkswagen engine. The driver would be unharmed in his capsule. Like many great inventions or technical advances, the unique Pookie was the product of desperate circumstances. Designed, tooled and rigged by a remarkable Rhodesian automotive engineer, Ernest Konschel, the Pookie evolved in November 1976 at a moment when Rhodesia was facing her greatest crisis in her eleven years of 'illegal' independence since 1965. After failing to secure an accommodation with Britain, Ian Smith had declared Rhodesia unilaterally independent on 11 November 1965. By doing so, he incurred the wrath of the British who had increasingly tightened a sanctions-net around him with the concurrence of the United Nations and most of the world. If Britain declined to use force to overthrow Smith’s Rhodesian Front government, the Rhodesian African nationalists did not. The two factions of African nationalists who aspired to power, Zimbabwe African People’s Union (ZAPU) led by Joshua Nkomo and Zimbabwe African National Union (ZANU) headed by Ndabaningi Sithole (and ultimately by Robert Mugabe) sought outside assistance. This took the form of bases and logistical support in neighbouring countries, Zambia and Mozambique, and weapons and training from the sympathetic Soviet and Eastern blocs. Among the more effective weapons received by ZAPU’s Zimbabwe People’s Revolutionary Army (ZIPRA) and ZANU’s Zimbabwe African National Liberation Army (ZANLA) were anti-personnel and, more significantly, anti-tank landmines. At first Rhodesia weathered the sanctions, finding willing buyers of tobacco, asbestos, chrome, gold, nickel and a dozen other minerals and commodities. She also contained the war being waged against her by ZIPRA and ZANLA across the Zambezi River from Zambia and Mozambique. However, the 1973 crisis in the Middle East drove up oil prices and threw the world into depression, directly affecting Rhodesia's clandestine exports, the source of her foreign exchange. Foreign exchange became increasing harder to get for the purchase of vital commodities such as fuel. The Rhodesian economy was hard hit. Then long years of armed rebellion in all of their African possessions of Guinea-Bissau, Angola and Mozambique broke the nerve of the Portuguese. In April 1974, the Portuguese government was overthrown in a military coup and Portugal began to extricate herself from Africa. Her handing over of power in Mozambique to her rebellious African nationalists, then led by Samora Machel of FRELIMO, affected Rhodesia directly. Mozambique had been a major conduit for Rhodesian exports and imports. FRELIMO had been assisting ZANU and now became ZANU’s principle benefactor by supplying camps, training and logistics to ZANLA as well as opening a 700 kilometre long border with Rhodesia to penetrate. South Africa, Rhodesia’s other principal benefactor, took fright at the loss of Mozambique. The South African Prime Minister, B.J. Vorster, decided that it would be better to have an African-dominated client state on his northern border than embattled Rhodesia. He began to coerce Smith into settling with the African nationalists. A South African misadventure in Angola in late 1975, when intervening with covert American CIA assistance on the side of pro-Western African nationalists against the Communist MPLA, convinced Vorster that change in Rhodesia was imperative. He involved Henry Kissinger, then US Secretary of State in the Ford Administration, to coerce Smith into conceding majority rule on 21 September. This implied, of course, a transfer of power to the African nationalists. At the moment when Smith made his concession on majority rule, the African nationalist guerrillas, and ZANLA in particular, had stepped up the pace of the war, crossing the Mozambique border to politicise the rural Africans in the tribal areas and to attack the security forces and the infrastructure of the state. These efforts were not particularly successful but the Rhodesians had only small forces to put into the field. On any one day, the Rhodesians could deploy only 1,400 troops to cover an area the size of Montana. Undaunted and inventive, the Rhodesians devised methods to use what they had to maximum effectiveness. An example was the successful use of air mobility and firepower in the form of the helicopter-borne Fire Force. The kill rate remained vastly in the Rhodesians favour at about 80:1. The insurgents, nevertheless, had one weapon, the landmine, which could not only go far to negate all other Rhodesian advantages but have a decisive effect. The poorly trained and lightly equipped guerrillas found it difficult to survive a sustained fight. They had neither air cover nor artillery, only sometimes heavy machine-guns, recoilless rifles or mortars. If they were forced to hit and run, the landmine, however, gave them a weapon to cripple Rhodesia. The doctrine of their Soviet instructors had taught them that 'the landmine is a potent weapon of area denial'. To cut lines of communications and to terrorise, the landmine is a more cost-effective weapon than most. Buried in the wheel-track of a narrow dirt road, a landmine is more certain to hit and damage its target than any artillery shell. Furthermore, it does not require a gun to fire it and a crew to serve it. It needs nothing more than a spade to position it. It can be buried and forgotten. Eventually, a vehicle will detonate it. By 1978, eleven landmines were being detonated and six recovered every week on the thousands of kilometres of gravel roads, destroying vehicles and killing or maiming passengers and drivers. As will be seen, by 1976, efforts had been made to minimise the military casualties but the cost of repair to vehicles ate into the dwindling stock of foreign exchange because parts had to be purchased from abroad. Vehicles would be off the road, sometimes for months. In addition, civilian casualties increased as only rarely were civilian vehicles modified to protect their occupants. There was nothing new about the threat posed by the landmine in 1976. Indeed, the threat had been recognised in the late 1960s because of the devastating use of landmines by insurgents in neighbouring Mozambique and Angola. The threat became reality in Rhodesia from April 1971 but for the next eighteen months, landmines were so rarely encountered that little was done to counter them and the risks were largely discounted. In 1971-1972, only two army and one civilian vehicle hit landmines in Rhodesia, admittedly with fatal consequences. It was believed that hard impacted roads were a deterrent to the laying of landmines and that therefore only soft sandy ones posed a danger. Reality was quite different, eventually even hard tarred surfaces were dug into, and then the hole disguised with elephant dung or by melting tar fragments. On 21 December 1972, ZANLA began its new offensive with the attack on Marc de Borchgrave’s Altena Farm at Centenary in the north-east The farmhouse endured a brief burst of fire which wounded de Borchgrave’s young daughter before the attackers fled into the night. The next day a Soviet TM-46 anti-tank landmine, boosted by 16 kilograms of high explosive, was found in the approach road. Two days later, a neighbouring farmhouse on Whistlefield Farm was attacked and an Army truck coming to the rescue detonated a landmine with its rear wheel. Corporal Norman Moore of the Rhodesian Light Infantry (RLI) was killed and three others seriously wounded. ZANLA and ZIPRA stepped up their mining of all roads and sustained this effort until the end of the war in 1980. Laying landmines became the standard guerrilla means of cutting roads, isolating garrisons, terrorising people and inflicting damage and casualties on the security forces and any other users of the roads. The effort to neutralise the landmines took different forms. One way was, obviously, through the interception of supplies. Another was to tar the roads. The third method was to minimise the effects of the explosion (because no vehicle can be 'mine-proofed') by devising methods of protecting the crews, passengers and parts of vehicles. The fourth solution was to improve the rate of detection so that the landmine could be found, lifted or exploded. Immediate action was taken in 1973 but did not really solve the problem. The Rhodesian SAS went over the border to deal with the porters who were carrying weapons, landmines and other munitions into Rhodesia. However, the vastness of the region meant that landmines still came in. The Ministry of Roads began to bring more roads under tar. It was not possible, however, for economic and other factors, to tar all the roads and a tarred road could still be mined, with difficulty. Finally, the rate of detection with the tools at hand, the prod and the standard metallic landmine detector, showed little prospect of improving. Consequently, efforts were concentrated on ways of improving protection against blast from landmines in vehicles. Research was undertaken in collaboration with the South Africans whose forces in South West Africa [Namibia] had begun to suffer casualties from landmines planted by the South West Africa People’s Organisation (SWAPO), particularly in the Caprivi Strip area adjourning the western tip of Rhodesia. The first step taken to protect occupants of vehicles was to adopt the universal response to landmines, first devised in the campaigns against the Axis forces in the Egyptian and Libyan deserts, that of sandbagging the vehicle. The Portuguese had done this in Mozambique. The Rhodesian Army also stopped travelling in Land Rovers, arguing that a heavy truck was needed if men were to survive a landmine. The police, however, patrolling in small numbers, could not afford to abandon the Land Rover. They fitted steel plates to deflect blast and added heavy-duty mine conveyor belting to absorb blast and shrapnel, heavy roll bars and shoulder harnesses. Doors were removed and hatches were cut in roofs to prevent blasts being trapped. By 1980, 162 landmine-protected long-wheelbase Land Rovers had detonated landmines. Although, 45 occupants were killed and 270 injured, no one was killed when sitting in the cab. Faced with increasing casualties, the Army then added deflection plates to their heavy Bedford trucks, removed the doors, cut holes in the roofs of the cabs, lined the wheel arches with double layers of conveyor belting, and sandwiched the sandbags in layers of conveyor belting on the cargo beds. Water was pumped into each tyre to add weight and to lower the centre of gravity to prevent the vehicle from being overturned. A consequence was the discovery that the weight of the water diverted the blast sideways and cooled the heat of the explosion therefore dampening its effect. Often, while the tyre had disintegrated, the wheel was intact and it only required a new tyre to get the vehicle mobile again. Drivers were instructed to drive slowly to lessen the effects of the consequent crashes of the stricken vehicles. The last measure was to add shoulder harnesses for all men on board to prevent spinal injuries and the like. The theory of the time was that the men had to sit on hard seats because it was believed that cushions caused the body to bounce on the accelerating seats, demolishing the spine. Later, after 1980, studies on acceleration in aircraft seat ejections and space travel showed that firm cushioning absorbed, not magnified, the shock. Thus, the next generation of South African vehicles were decidedly more comfortable to travel in. The combination of water, sand, conveyor belting, seat belts and slow speed drastically improved the outcome of a detonation. The effort did not end there. The Rhodesian Mine Warfare Committee and the representatives of the South African Defence Research Unit in the Joint Mine Warfare Committee realised that the blast from the landmine was simply trapped under the flat underneath of most service vehicles, thrusting the vehicle upwards while penetrating the floor with drastic consequences. As the rapidly expanding gas of an exploding landmine began to disperse at 500-600mm, the answer was to allow the blast to escape. A series of experimental vehicles were given V-shaped hulls 600mm clear of the ground to dissipate the blast. This worked, and not only were casualties drastically reduced, but vehicles could be repaired, having simply lost a wheel, thus saving precious foreign exchange. 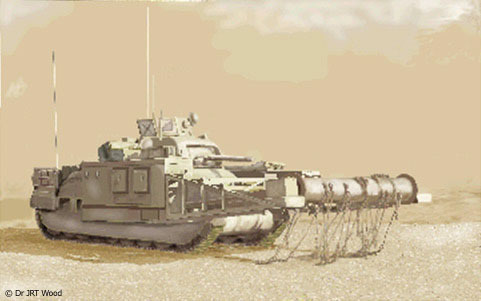 This effort produced many versions of light and heavy landmine-protected vehicles (all named after animals). Many are still in service in the 1990s, the Zimbabwean heavy four-wheeled armoured personnel carriers (APCs), the Pumas, seeing duty in Somalia. The ultimate landmine-protected vehicle is the South African Casspir, a four-wheeled ten-tonne APC. It can protect its crew from double- or even triple-banked anti-tank landmines and remain repairable. The protection is, firstly, through its V-shaped armoured hull, which deflects the blast and debris from the crew, and, secondly, by its stability which saves it from being overturned. The fuel tank, equipped with a blast-proof cap, is within the hull as is the engine and transmission. The battery and the engine sump drain are also blast-proofed. When the Casspir detonates a landmine, it will lose a wheel but not its crew. The design of the suspension aids rapid replacement of wheels of which two spares are carried together with rapid-change fittings. The armoured hull and bullet-proof windows give the crew protection also from small arms fire. The height of the vehicle also allows the crew to see over and into the long grass of Africa in a potential ambush. If landmine-protected vehicles reduced military casualties, vehicles were still being damaged. Furthermore, civilian vehicles, rural buses, for example, were unprotected with terrible, almost daily, consequences. What was needed was a way to find landmines at speed. Successful metal landmine detectors had existed since the Second World War and could be obtained from South Africa. Furthermore, the Soviets and Chinese obliged the Rhodesians and South Africans by supplying mainly metallic landmines of the TM-46 series to the insurgents. The plastic landmine, of course, could not be easily detected. Had minefields been the problem, they could be successfully tackled by methods tried and proven over the last fifty years. However, the Rhodesians had to find the randomly laid landmine in hundreds of kilometres of road at a minimum cost to lives and vehicles. In 1969, this seemed insurmountable. The only certain ways were to sweep with the hand-held landmine detector, which meant that a man had to walk ahead of the convoy, or to use free-running dogs, mainly Golden Retrievers, trained to smell buried landmines. The Rhodesian dogs, to their credit, never missed a landmine but, of course, they could only move at a trot. The cutting of the speed of convoys to walking pace was accomplishing at least part of the guerrilla’s aim. In Mozambique, Portuguese soldiers resorted to walking ahead of convoys, prodding the ground with pointed probes. The Portuguese phlegmatically adopted the surest method of finding a landmine, by detonating it with a heavy vehicle whose lone driver sat on a sandbag, lost in suicidal thoughts, perhaps. Flailing the ground to explode landmines along hundreds of kilometres of dirt roads was, of course, not an option. For a brief period, landmine sentries, including the author, were perched on the front of vehicles, peering at the ground to alert the driver to signs of digging. Fortunately, the idea was quickly abandoned before anyone was killed. On the other hand, study of road surfaces did pay dividends because, in the late-1970s, experienced Pookie drivers learned to spot a buried landmine before their detectors found it. The pattern of laying was studied and troops were taught to be wary of the approaches to bridges and cattle-grids, of shadows of large trees, potholes and ruts filled with water in the rainy season, and the like. 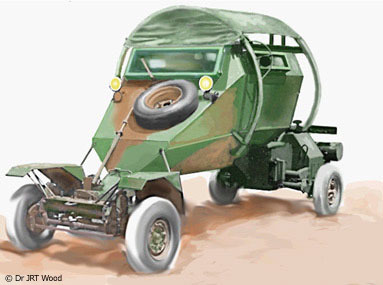 By 1974, with the help of a small group including Trevor Davies (the manufacturer), Ernest Konschel had produced the vehicle from which a landmine carrier, the Pookie, would evolve. The vehicle was the Leopard landmine-protected light vehicle based on components from the Type Two Volkswagen Kombi. Essentially the Leopard had a V-shaped four-seat monocoque armoured capsule set some 500 millimetres above the ground between the front and rear suspensions from the Kombi. Thus, there was no chassis under which a landmine blast could be trapped. Nor were the wheels under the vehicle so if a wheel detonated a landmine it would be blown away without hitting anything. The use of shear bolts aided this process. The battery and the fuel tank were also positioned with the engine at the rear and designed to be blown clear. The centre of gravity enabled the Leopard to remain upright but, if it did not, it had circular roll bars. Thus, the Leopard was not only safe but could be repaired swiftly and cheaply by replacing either the front or rear suspension units. Konschel also improved the performance of the Leopard by modifying the gear reduction so that the top speed in first gear was a walking pace, enabling the Leopard to climb obstacles that Volkswagen, Germany, believed impossible. The prototype was developed in six weeks. In all, 800 Leopards were built. Sixty-seven of them hit landmines, killing only one occupant. Forty-one people were injured but most through not wearing their seat belts. A further five people travelling in Leopards were killed in ambushes by rifle or rocket fire. Such success was later repeated with the Cougar, Konschel’s replacement for the Leopard. However, the problem remained that, when these vehicles hit landmines, they were still damaged. The cost of repair began to cripple the country and the psychological effects were untold. The need to clear landmines was paramount. The South Africans had invented large landmine detecting pans for fitting onto vehicles and they supplied them to the Rhodesians. The Rhodesian Mine Warfare Committee considered mounting Milton landmine detecting pans on their vehicles. The problem was that, even if the Milton pans were suspended on a boom in front of a vehicle, there would be little time for the driver to stop the vehicle after a landmine was detected before his front wheels detonated it unless he was travelling literally at a crawl. Speeds would have to be less than a walking pace and there would be no margin for error. Nonetheless, the Milton pans were mounted on a boom in front of a Bedford. The test revealed another reason for the slowest possible speed because the vibrations were at such at level that false alarms rendered the exercise pointless. The boom was transferred to a Leopard but the vibrations did not lessen and, in any case, if the Leopard, like the Bedford, ran over a landmine, it would detonate it. The Mine Warfare Committee brought in the Corps of Engineers and the University of Rhodesia to solve the problem. Lieutenant Colonel Mike Pelham and Ernest Konschel and others then tossed the problem about. They considered a hovercraft as a way to cross a landmine but it was not practical. The need for a vehicle exerting a light ground pressure was recognised and discussions on the use of multi-wheels led to the idea of wide low pressure tyres fitted to a monocoque single seat vehicle, built on the lines of the Leopard. The result was that Formula One racing slicks (tyres) were obtained, tried and adopted. In addition, they were bought cheaply from the Kyalami Race Track in South Africa because there were no further uses for discarded racing tyres. The Formula One tyre was also wider than the average landmine hole and made a detonation even more unlikely. With these ideas in mind, Ernest Konschel and Trevor Davies set out to create a vehicle, the Pookie (named after the Galago, little furry wide-eyed night ape), which could cross a buried landmine without exploding it. This enabled the landmine to be detected and lifted or destroyed harmlessly. Konschel and Davies produced the prototype Pookie, positioning on shear bolts a small one-seat armoured V-shaped monocoque capsule between the front and rear suspensions of the Type Two Volkswagen Kombi. 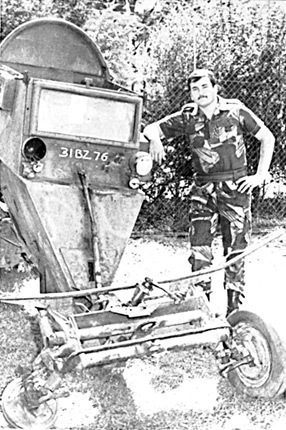 When tested in front of Army, Air Force and Police commanders, the Pookie was driven over a TM-46 landmine without depressing the detonator. Seeking a ground pressure of less than five pounds per square inch, Konschel had achieved three pounds pressure, less than that of the human foot, through his wide soft tyres and the trailing arm suspension of the Kombi. In fact, the Pookie will not even detonate standard anti-personnel landmines. The problem of the vibrations remained as the Milton detecting pans were still mounted in front of the vehicle on the boom. Then the idea struck home that the least vibrations would be experienced in the centre of the vehicle. The Milton pans were re-positioned under the driver’s capsule, hinged on brackets so that they could be raised on nylon ropes when not operating. The Pookie was capable of finding landmines at 80 kph, which meant that convoys could reach their destinations safely and quickly. At a time when the average cost of a repair to a landmined vehicle in parts alone was R$17,000, Konschel produced the Pookie for R$11 000 a unit. This meant that a Pookie only had to find and neutralise one landmine to pay for itself. The Pookie was ready for action in late 1976 and on its proving run, down the notorious Mount Darwin - Mukumbura Road, littered with parts of blown-up vehicles, it found 12 buried landmines. In fact, the Pookie proving team, under the command of Lieutenant [now Major] Patrick Gericke, found the first two landmines within five kilometres of Mount Darwin. This sold the concept to the Rhodesian Government. Pookies now began to run in front of convoys, finding landmines daily. The Pookie drivers, all reserve personnel on call-ups, drove some 200 kilometres a day, taking convoys through. The pans, however, continued to vibrate, being flat, bounced somewhat on the rough roads, and lifted like wings at speed. Mike Pelham realised that a cylinder rather than a flat pan would reduce the vibrations further and would not ‘fly’. The South African manufacturers, however, said that cylindrical detectors could not be made. He ignored them and called up two young engineers to serve at the University to solve the problem. This they did, producing his cylindrical detectors. Between 1976 and 1980, the Pookie found over 550 landmines but never detonated one. Sixty-eight were built and 12 were damaged in ambushes by command-detonated landmines or rockets. Only one driver was killed, by a rocket through the armoured windscreen. When ambushes became more frequent when ZANLA realised that the Pookie was blunting their landmine offensive, the Pookie was armed with the Spider 24-barrel rotary 12-gauge shotgun. The Spider, fired in ripples by the Pookie driver pulling on a chain, covered a 270-degree arc with buckshot, either as prophylactic fire or as a riposte in an ambush. In such awe did the insurgents hold the Spider that they began to let the Pookies through the ambushes and attack the convoys instead. In operation, the Pookie ran 100 metres or more ahead of a convoy. An increase in tone in his earphones would tell the driver that he had crossed a landmine. The Milton landmine detectors could detect a metal bottle top in the road but the drivers were trained to recognise the volume of sound when the detector found a landmine. The driver would halt, flick on his mine-warning lights, red lights either side of his cab, and then warn the convoy commander on the radio. At the glimpse of his lights, the convoy would pull up. The Pookie would reverse back over the landmine and then forward again until the driver was able to mark the precise spot. Having marked it, the driver would move the Pookie back, dismount and tackle the landmine. On occasions sappers escorting the convoy would back him up and they would come forward to deal with the landmine. The landmine would be exposed and then pulled with a grapple or exploded in situ. Once the landmine had been dealt with, the Pookie would lead the convoy off. The Pookie not only was effective at finding metallic anti-tank landmines but it had significant psychological effects. Firstly, the reduction in casualties and in damage to vehicles was a significant victory. As the author can recall there was a decided lift in morale in convoys when a Pookie roared up to take the lead. Secondly, the insurgents thought mistakenly that the Pookie could find any landmine including the plastic mine. The net result was that ZANLA would stop laying landmines on roads regularly swept by the Pookie and lay them elsewhere in the hope that they would not be found before they could achieve their objective. The Rhodesian Corps of Engineers took to moving Pookies on trailers, hidden by tarpaulins to conceal their identity from the insurgents and their informers so that time was not wasted on roads that in reality were safe. The success of the Pookie and the landmine protection measures provoked the insurgents to boost their landmines, to devise lethal centre-blast mines and to lay landmines in tarred roads, which, of course, being regarded as safe, were not swept. ZANLA also laid landmines on bush airstrips, destroying at least one aircraft. On Monday, 19 February 1979, for example, B.R. Gardener, an Internal Affairs pilot, and three District Security Assistants, L. Mchonjomera, C. Ndhlovu and J. Nyamayaro, were killed when their light aircraft detonated a landmine on a gravel runway at Mutawatawa Airstrip, near Mrewa, 75 kilometres north-east of Salisbury [now Harare]. To combat this the Air Force adopted the cheapest possible copy of the Pookie concept, a pedal-powered landmine detector with the Milton pans to sweep the strips each dawn. 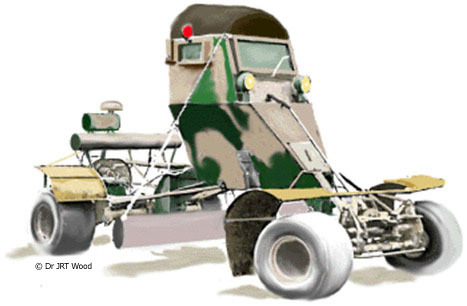 The Pookie remains the only landmine detector carrier capable of driving over landmines without exploding them. Refurbished and re-engineered by irrepressible Ernest Konschel and ex-members of the Rhodesian Corps of Engineers, and adapted to carry any of the state of the art detection equipment, the Pookie is ready to resume service anywhere in the world where roads require to be rendered safe.